Missing My Pen: Book Fair! Hey, guys! I'm posting late (again) today because 1) I went outside for the whole day, and 2) This freaking unstable Internet connection is killing me. Anyway, I finally managed to write a blog now (gah, I haven't bathed). So today, I went to a book fair in Kuala Lumpur, organized by Popular Bookstore (my favorite retail store <3), where they were selling books at RM5. *gasps* Just five! Normally, a book here would cost RM50 at the most. Hooray for 90% discount! Though there was a catch: a customer can only buy 10 books, which tallies to a single novel. I had a difficult time browsing. There were so many books—and hundreds of books of the same title—that I could choose from. Classics, thrillers, horror, sci-fi, fantasy, they are all there. Even Throne of Glass—HARDCOVER edition! But I didn't buy that, well, I've already a copy of the book. Most of the books were dated at 2013. There weren't any J.K. Rowling, Stephenie Meyer, nor Suzanne Collins though (cri). I ended up buying six books. Four of them part of a fantasy series, one sci-fi, one thriller (because my mother wanted to read). It's late at night now, so I don't think I'll be doing any writing today. I'm also beat from the traveling here and there. Oh yeah, Empire of Storms wasn't there, unfortunately. So I went to my local bookstores—and guess what?—they still don't have it. -_- The anticipation is killing me. 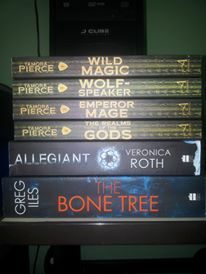 I've planned to read Veronica Roth's books, so I envy that Allegiant in hardcover right there. In october, I'll start with divergent. Have you already read it? Anyway, great choice! Unfortunately, my Allegiant copy isn't in hardcover. :( I haven't read Divergent (never found it in the fair), but I know what happened in that book. I also haven't read Insurgent, though I watched the movie (never found it in the fair either). If I were you I would certainly go to the book fair far way in KL. Hehe..unfortunately I have extra 'handbags' which I need to carry with me, so I think I'll just go to the nearest book store which is XCess book store. I'll try to check there for the book that you wanted. See you at school.